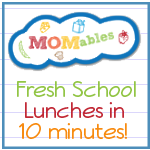 Biting The Hand That Feeds You: Easy and Fun Lunches for School! 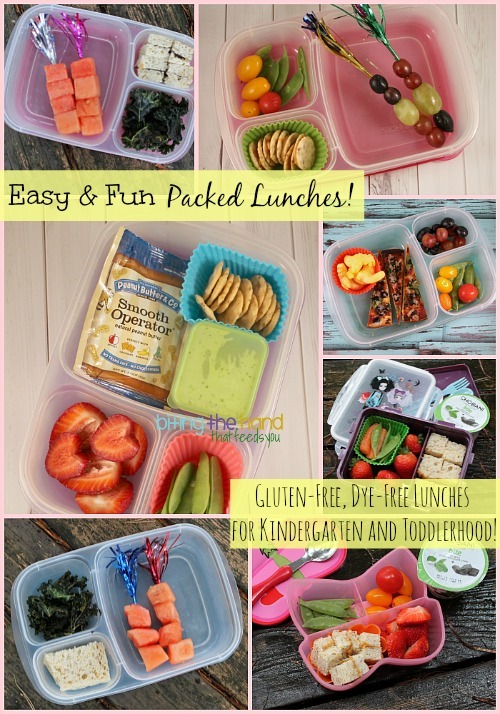 Easy and Fun Lunches for School! 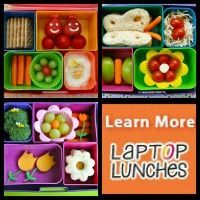 This year I seem to be allll about the quick and easy for lunches. And apparently my ability to plan in advance has been surgically removed. 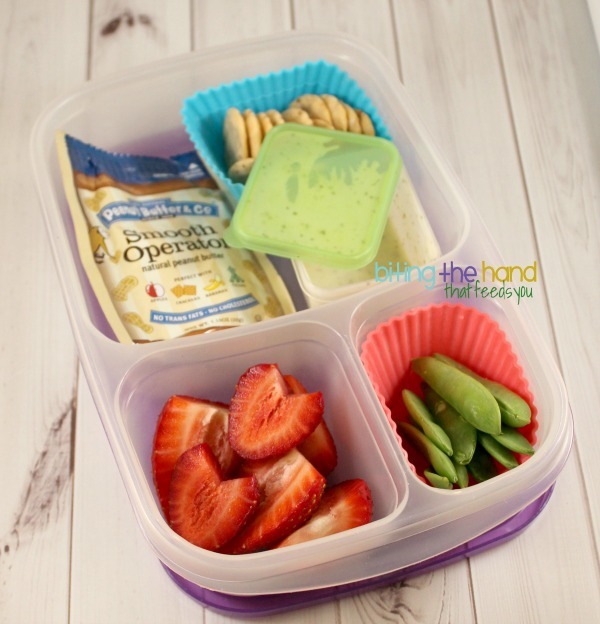 So last-minute slap-it-together lunches it is! The toddler got some leftover gluten-free Pizza Dippers. Domino's offers a gluten-free crust, which is a great option for when we need pizza delivered somewhere, like at a party, or when I am just feeling too lazy to do anything (I can order it via an app on my phone! Barely have to lift a finger!) So I order half of it without cheese for E, since they don't have any other non-dairy options. This time I ordered it with spinach in addition to her olives, to see if she'd go for it, and to help hide the lack of cheese. For the leftovers, I sprinkled on some vegan cheese shreds and broiled for a few minutes before cutting into thinner slices for her lunchbox. I had packed Pizza Dippers for both girls the night before, but I packed them early enough the toddler caught me taking photos and wanted to eat hers right away. 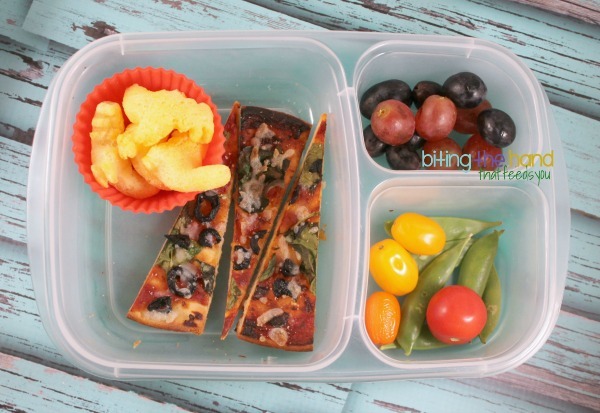 She ended up just eating the fruits and veggies, so I repacked the pizza into this lunch. You can see Big Sister's lunch here. 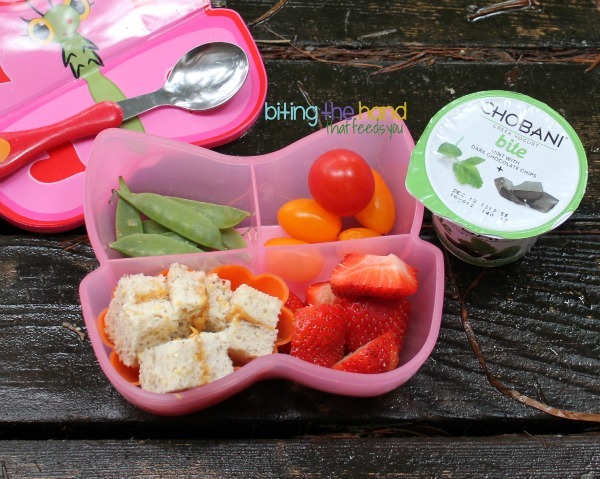 Z enjoys putting the peanut butter on her own crackers, so it's a great quick and easy lunch solution for me when I'm stumped for ideas or in a hurry! The Ranch was left over from Z's Pizza Dipper lunch the day before; otherwise I wouldn't normally pack any just for sugar snap peas. E had seen me stringing grapes onto tinsel fringed skewers for Z's classroom snack Sunday night and had gone ape over them. 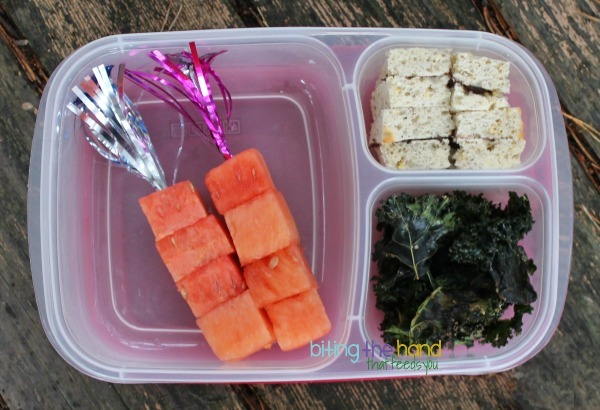 Since I had already packed Monday's lunch at that point, I saved some for Tuesday's lunch for her! She also got crackers with peanut butter, but I assembled hers for her. She can't be trusted. 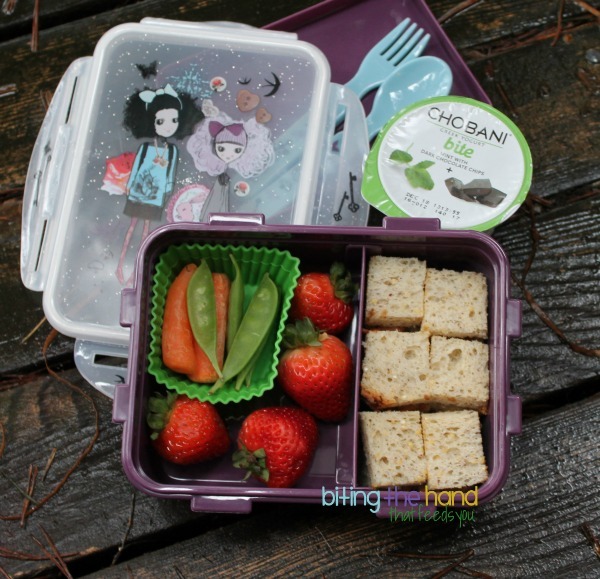 Since I decided to pack a Chobani Bite for each girl this day, they didn't need such big lunch boxes, so I got to trot out some of the smaller ones I don't use very often. E got the Bella Butterfly snack box which I thought she'd enjoy. She did like all the nibble-sized food, but the yogurt was a huge mistake. Chobani is very runny, and she got it all over herself. "It ah erver me Mama! WAAAAAAH!" Z looooves the Chobani Bites, since the three flavors I have bought (coffee with chocolate chip, raspberry with chocolate chip, and mint with chocolate chip) are all amazeballs. But since I can't eat them anymore, now that I know I'm intolerant to the casein in milk as well, I only buy them when they're on clearance or super sale. 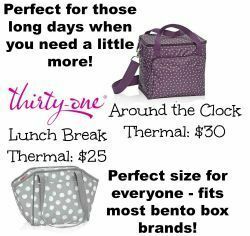 These were short-dated, so I tossed two in the freezer and two in their lunches! This box was a Target exclusive from Paperchase, in their Alice in Wonderland line. It's no longer available. 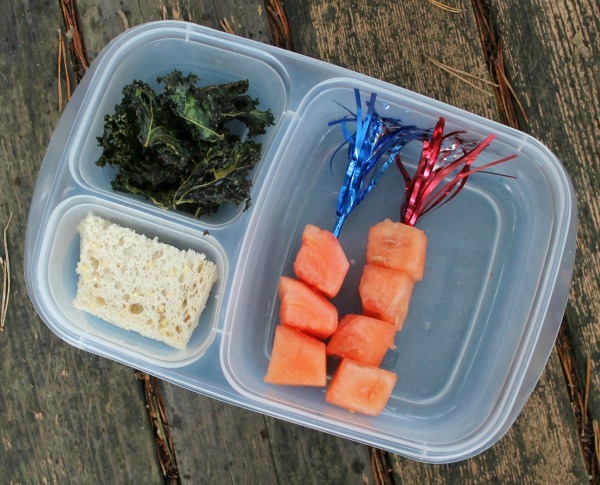 I had bought some watermelon spears to incorporate into one of the snacks for Z's snack week at the private Kindergarten, but didn't end up using them. 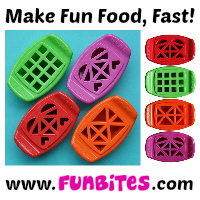 Which left a lot of watermelon for me to use up fast! 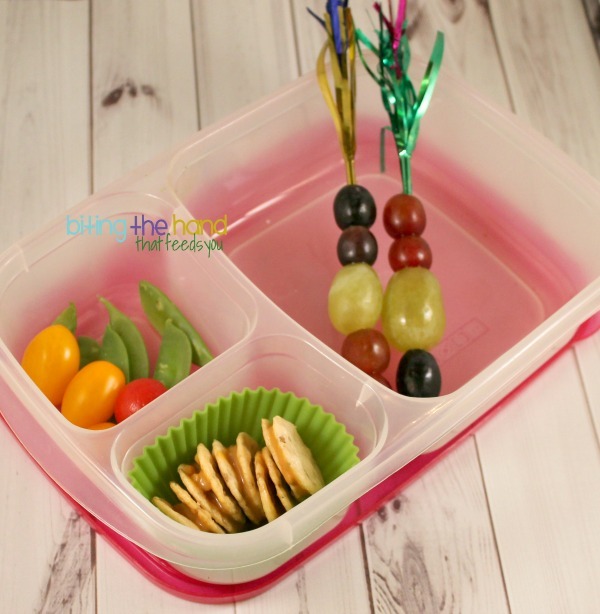 My girls don't seem to like melon, so I don't get it much, even though without gluten bread and sliced cheese, there's nothing else left for me to use my cute imprint cutters on very easily. Jerks. Same thing for Little Sis. Neither girl ate much watermelon, so I ended up finishing it off after school. These are all super cute and tasty looking!